At the time of writing, Oz Weather is listed as 7th in the list of top paid apps in the Australian iTunes store. So apart from that warm, fuzzy feeling you get when you see your the fruits of your labor actually being bought and used and appreciated, just what does this mean? In particular I mean in terms of sales and revenue. Is that level of success enough for someone to retire on? Or is it just a folk legend that you can get rich quick if you can just find someone to help you build your own iPhone app? 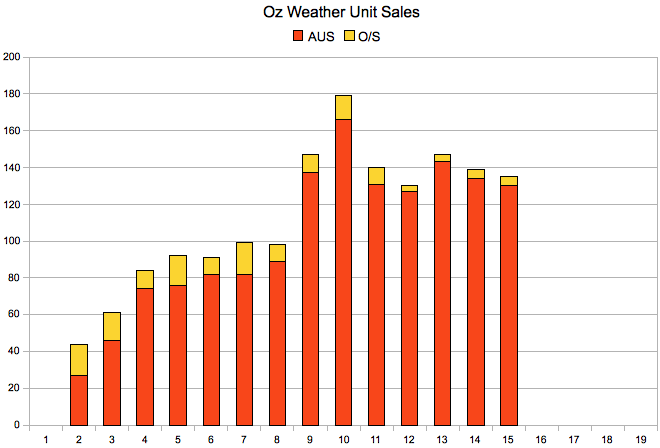 Its not the norm to publish your own app’s sales and revenue figures, but I thought that by sharing Oz Weather’s data I might encourage some others to share also, and so perhaps help us all build up a true picture of the economics of building and selling iPhone applications. I started developing the weather data collection back-end in June 2008, before I had any expectation of building an iPhone app. At that point, I was just experimenting/playing with a prototype web application displaying some useful world-wide weather data in a different and more-accessible way than is available elsewhere. I used PHP and MySQL and put together a basic website using Dreamweaver. I probably spent about 10 days worth of effort in putting this together. However, I’m not going to count that as part of my economic assessment, because it occurred prior to project commencement proper, and I would have done it anyway. The first phase of the project proper was to build an iPhone web-app (the idea being to test the water before attempting a native app). To do so I invested AUD$1400 (US$1,000) to hire a designer plus AUD$100 (US$70) in miscellaneous other costs, and spent about two weeks of my own time to adapt the existing back-end to cope with detailed Australian specific weather data, and to fine tune the app to its release state. The result was a web app listed and endorsed by Apple as a “staff pick”. If the total effort invested of 40 days were factored in with a modest contract programmer’s rate of say AUD$350 per day (US$245), the total project cost would be AUD$15,500 (US$10,850). For the first 14 days of sales, the total number of units sold was 1586, and averaged 140 units per day over the last 7 days. The daily sales are graphed below, for the period Nov 1 to Nov 15, 2008. Sales to Australian customers are shown in orange, and to overseas customers in yellow. The initial web app was monetized by including AdMob advertising as a banner across the top of the page. In a previous post I mentioned that AdMob had started with an eCPM of about US$7, but shrank progressively to around US$1.20, which is roughly where it remains now. With about 26,500 cumulative ad requests so far, at an average fill rate of 77%, total advertising revenue amounts only to about AUD$50 (US$37). In contrast, the native app went in for sale at Apple’s “Tier 2” retail price of AUD$2.49 (US$1.99). After deducting 10% Australian Goods and Services tax (applicable to sales made to Australians), and Apple’s 30% share, this leaves approximate revenue of AUD$1.58 (US$1.39) per copy sold. Hence total revenue so far is about AUD$2,500 (US$1,750). This current weekly average rate of sales if it were to be maintained equates to AUD$6,700 (US$4,700) per month. That look like a good rate of return for the investment of AUD$15,500 (US$10,850), suggesting a break-even point at between two and three months. However, I believe that the likelihood of maintaining the same rate of sales over an extended period of time is low. Here are a few reasons why. I gather that there is typically an early peak in sales, especially as your app initially appears at the top of the list of recent releases, and is hence typically most visible to potential customers in its earliest days in the app store. It also gets a boost if it rises into the top ten (as it then appears on the front page of iTunes in the top apps listings – apparent in the graph above on day 9), but if it drops down below 10th again, then visibility is lost, and hence that fall in popularity is likely to be amplified, too. There is the factor of competition. There was already a very worthy competing Australian weather app in eh app store before Oz Weather was launched, and although they have now dropped back in popularity (sorry guys, if you’re reading this! ), they could rise again, and there could be further new competitors too – perhaps even more so if others like look of these revenue figures. There is the possibility of market saturation for this type of product. Whilst the market is continually growing in size, with ongoing new iPhone sales, you may manage to saturate pre-existing iPhone owners, and have to rely only on sales to new iPhone acquirers. No doubt other developers with app store experience will also have some thoughts on this… If so, please do leave a comment. Of course I would be lying if I suggested that I wasn’t optimistic about doing much better than just breaking even with this app. But its early days yet, and I haven’t got a lot of other app data to compare with. When looking at the bigger picture and applicability of these figures to other apps and other countries, the following points are probably also relevant. Because the Oz Weather app has only Australian weather content, these figures reflect the apponomics of the Australian iTunes store only. The population of Australia is only about 7% that of the USA, and hence equivalent app ranking in the US iTunes store may well reflect a much higher level of sales than those I am reporting here. However, there is also likely to be a greater level of competition within larger markets like the US, given the greater revenue possibilities these present, and achieving the same ranking is therefore also harder there. Whilst Oz Weather is a country-specific app, a weather app like this one has a broad target audience within Australia. Other applications which are more niche-oriented would presumably also have a much harder time achieving an app store ranking of this level in any country. I intend to report back from time to time to see which direction things are heading in as time goes on. And I also hope that some of you other iPhone developers out there will be willing to share your data (or at least their broad characteristics) too. That way we can all get a better idea about just what to expect before we actually start trying to implement our next big iPhone app ideas. So… now I have a question for you. Have these figures put you off, or have they encouraged you to get started on your own iPhone app right away? Thank you for your information it was very helpful. I am creating an app also. Do you know where i can find more information like this about other apps? Thanks for the help. Feel free to email if you wish. A well publicized example is Tap Tap Tap – http://www.taptaptap.com/blog/ – but would be great to find more, as different types of apps may have very different apponomic models. Pingback: TechNation Australia » Blog Archive » How Much Can You Really Make As An IPhone Developer? and thanks for sharing this information. You mentioned a rather steep learning curve being part of the development cost. Breaking even with the one application might be hard. However, you will be able to apply your learnings to future applications. Additionally you might develop different applications which pretty much use the same technology/implementation on the backend hence bringing down development cost significantly. So keep up the your great work and the fruits will be hanging lower in the mid term. You said you learnt object C etc while devloping in 30 days. How did you do this? Can you reccomend any websites, books or method to get on top of devloping for the iphone sdk with limited prior knowledge. I am yet to see a nice app for surfers. I would love to see an application that shows current and forecast swell and winds for particular locations. (perhaps similar to seabreeze.com.au and oceanoutlook.com.au) Perhaps you could easily implement this with minimal cost with your experience with creating OZ weather. Thanks again for sharing I would like to do the same once I get an app developed. Well firstly I have used a few languages over the years, including Delphi pascal (helpful for object oriented paradigms) and even a little C (helpful for Obj-C syntax) which did help me get to grips with it, and secondly it was a very focused effort – 30 days of intensive work & learning, and a bit painful and frustrating at times. But its very rewarding when, bit by bit, things actually start to work as you wanted them to. Apart from the very good Apple documentation, I also bought an eBook version of “Cocoa Programming for Mac OS X” (Third Edition) by Aaron Hillegass. This is not iPhone specific, but has great basics. Well done on being so open and posting your stats. I must admit I didn’t expect you to post everything so openly. I am one of the programmers of your ‘worthy competitor’ Pocket Weather AU. Wow – I am honoured that you decided to share that much! Thanks. And intrigued by your observation about being first to market. Perhaps you already saturated the Australian iPhone weather market before Oz Weather arrived. Fantastic information for all of us to ponder over. Hey Graham, congrats again on the release of your app. Both yours and the taptaptap blog you mentioned make for interesting reading. Simon- You might want to check out itunes as well, I’m sure I saw some free videos on there the other day for iphone and development and Cocoa. Thank you so much for sharing!! Loved the post, and love the app. It’s one of the few apps that I cannot live without and use multiple times everyday. Good post. Question is what is the size of your addressable market? Meaning will your sales volume support the # of downloads you need to break even? If I do some quick math. You need to hit about 7800 downloads to break even. At 30% market share that means the number of people in Oz that need to have the iPhone and be willing to download any weather app and pay for it is about 24,000. Still further extrapolating you will need to have about 100,000 IPhone users in Oz for you to meet those numbers (I assume about 25% of iPhone OZ users download apps that they are willing to pay for – which is a high number BTW). Hi Mukund – At this stage it would be a guess as to what proportion of owners would pay for a weather app, but a key factor is that the iPhone user base is continually growing. Recently published estimates suggest 1 million devices in Australia by end 2010 as compared to maybe 200,000 currently. So even if the existing user base was saturated, there are still potentially 1000+ new iPhone owners per day to cater for. I think you are doing well with your app. As I understand it, the US$10,850 weren’t real expenses, were they? It’s ok that you value your time that high, but you didn’t actually pay that sum to anyone, so the actual cost is much lower. Hi Quirky – its true that I did the development work without paying myself or knowing whether or not I would ever be paid for it. However, there was an “opportunity cost” involved ie. the income that I could have earned by developing an app for someone else instead. Without considering this, the figures wouldn’t reflect the true economics of app development. Previous Previous post: Are you being shortchanged by your iPhone’s GPS?